Farmersgirl Kitchen: Is Food Blogging good for your health? Is Food Blogging good for your health? Probably not, you tend to make too much food, eat too much food and generally sit hunched at your PC, laptop or tablet writing or interacting with your followers and friends online! I'm mostly approached to review food or food products (more temptation) but when I saw an opportuntity to review the Braun ExactFit 5 Blood Pressure Monitor, I thought this would be a good opportunity to see just how my blood pressure had stood up to the rigours of food blogging. 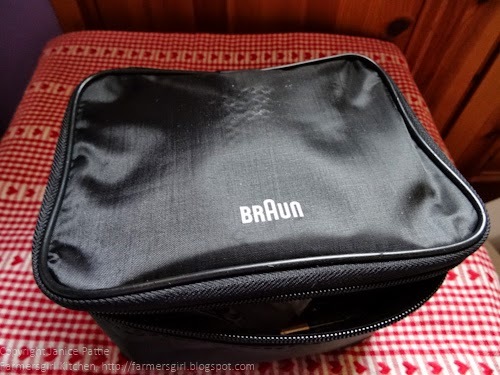 The Braun Exactifit has it's own neat bag to store the cuffs and monitor. 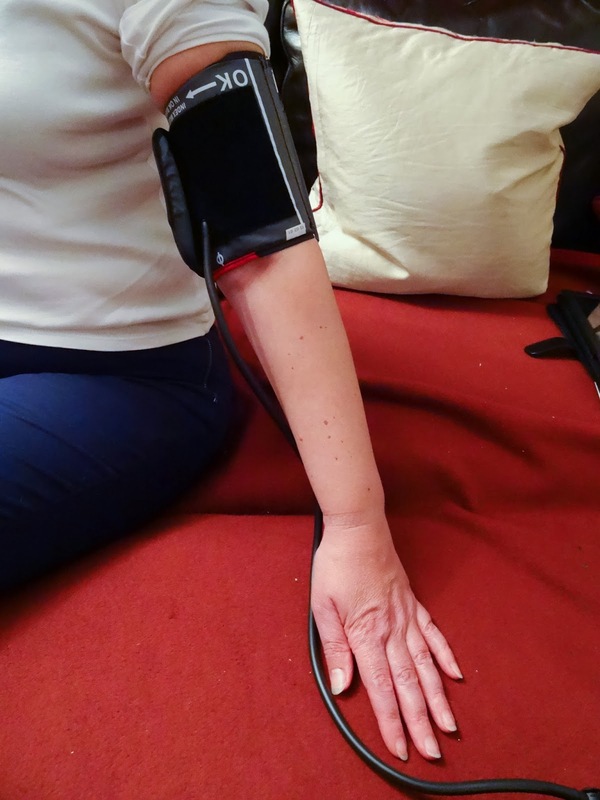 Surprisingly, getting your blood pressure checked at the doctors or pharmacist isn’t always adequate, as Camille continues.“Because of the ‘white coat effect’, blood pressure levels can vary when visiting the doctor or pharmacist compared to normal, everyday readings. This is why we encourage those who are at risk or who have hypertension to take their blood pressure at home with a device developed for home usage. Setting up the monitor was relatively easy too, a bit like setting your alarm clock or mobile phone, you need to put in the date and time as the monitor stores your measurements. The instructions were easy to follow and the batteries ARE included! 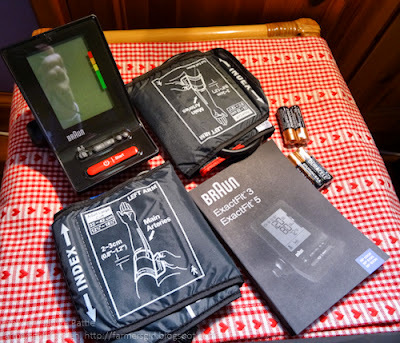 The Braun Blood Pressure micro site is well worth a visit and the videos there are even easier to follow than the instructions in the book. My husband was also keen to measure his blood pressure, so we agreed to take the readings morning and evening for a week to get a good idea of our readings over a period of time. We found that although there were variations between morning and evening, you can get an average after you have started to accumulate readings. There is an easy guide down the side of the monitor to show you whether you are in the healthy area or whether you should be taking measures to reduce your hypertension. I found it simple to put on the cuff and take a reading. This is the reading you get on the Monitor, the date and time at the top in smaller text. Systolic reading followed by Diasystolic and then pulse rate. If you look at the right of the monitor you can see a little arrow showing where this reading falls in the World Health Organisation (WHO) blood pressure values. You can see that my blood pressure is low on the scale which is very reassuring! The blood pressure monitor is easy to use and is also pretty accurate, we had visit at work from Occupational Health and I took the chance to have my BP checked by a professional, it came out at 124/76 which is fairly close to the average value I got with the monitor, if you take into account the 'white coat' effect and the fact that it was during a busy working day. The four AA batteries lasted for 24 readings which would make using the monitor on a regular basis expensive. I would have thought that this type of monitor could have had a built in battery which just needed plugging in to recharge, like your toothbrush (also made by Braun) or your phone! 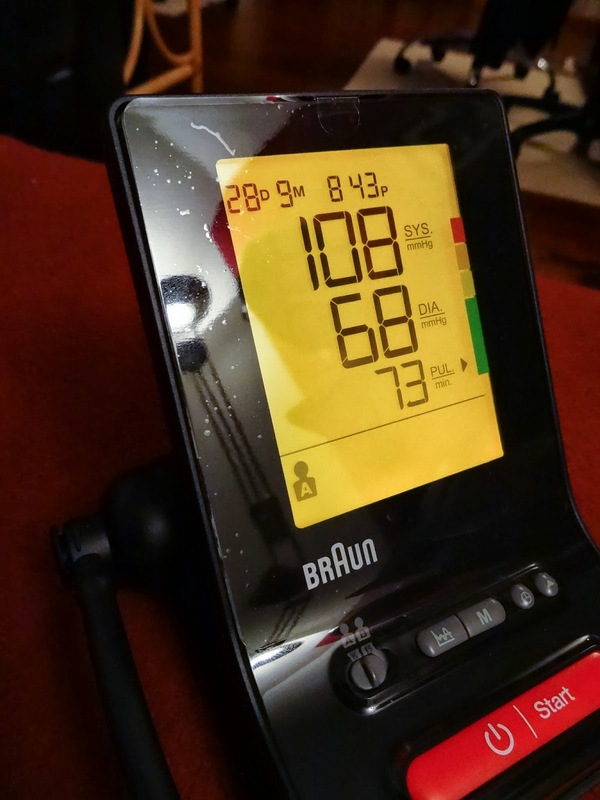 I would recommend this monitor to anyone who has concerns about their blood pressure. If you have had your blood pressure checked by a professional and are in the pre-hypertension or mild hypertension category, then the monitor would be good for you to keep track of your blood pressure, paticularly if you are taking steps to reduce it. If you hvae Severe Hypertension you should take the advice of your doctor. If like me you are right at the bottom of the normal range, then there is probably less of a need for regular checking. The monitor we used was the ExactFitTM 5 BP6200 which stores 60 measurements and gives a morning and evening average over the course of seven days. For further details visit www.braunbloodpressuremonitors.co.uk . Packed full of information and advice, Braun’s new microsite includes tips on controlling your blood pressure as well as practical videos showing you how to fit your Braun blood pressure monitor and understand your measurements. The Braun blood pressure monitors are available nationwide at selected Boots stores. 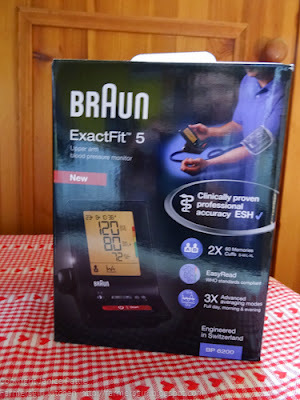 Many thanks to Sarah for giving me the opportunity to review the Braun Exact Fit Blood Pressure Monitor, I was not paid for this review and all opinions are my own. Hm, I don't know. Yes, maybe too much food and sitting in front of the computer. However, at least through food blogging I get more healthy food and ... otherwise I would spent the added time I use for cooking for sitting even more in front of the computer. My blood pressure feels alright. I never check it.